“…if we were on a ship in the ocean, every water drop in that ocean is a testimony of His nature and His goodness…the vastness of that picture is what I want people to encounter in this album. These songs are droplets, and they are precious to me, because I’ve spent time in that water. I hope that these water droplets invite people in. We have a kind God, a merciful God, a God who doesn’t hide his heart in pieces. I want to expose the little pieces I know in my heart to be true…” Worship music over the years has been evolving at an exponential pace over the past few years, and is my favourite genre ever of Christian music, if you could call it a genre at all (as worship is a lifestyle, but that’s for a later discussion…). Artists such as Meredith Andrews, Kari Jobe, Phil Wickham, and Kristian Stanfill have risen in popularity and prowess musically, giving glory to God as they vertically sing praises to Him. Yet on the other side of the coin are artists who create such beautiful music lyrically, sometimes praising God, as there are themes of worship overtly or covertly embedded, yet still also aim to record music for all kinds of people, such as Gungor, Sara Groves, Andrew Peterson, Switchfoot, Audrey Assad, Jars of Clay, Leigh Nash, Lifehouse, Mat Kearney, and Needtobreathe. What happens when you mould worship music together with music meant to be recorded as art and viewed from many different lenses? Music from both ‘genres’ if you will? 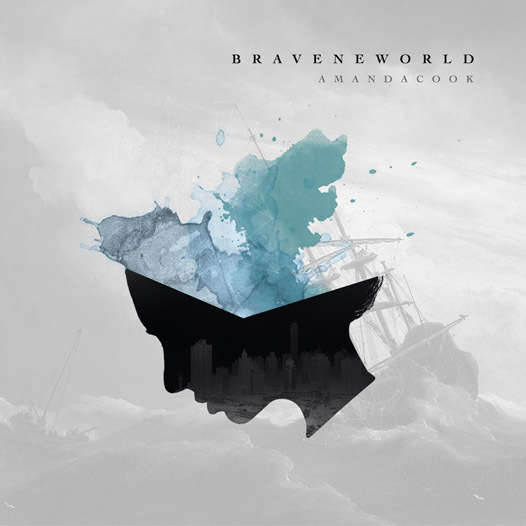 Well, look no further than Amanda Cook, the newest signing to Bethel Music, and her latest multifaceted project Brave New World, produced by Jason Ingram and Paul Mabury, the duo known as One Sonic Society. Already a member of the Bethel Music worship team, Amanda is no stranger to recording solo albums, having already recorded independent records as Amanda Falk, yet with her first international label debut album having released last year, let’s dive in to see how this album fared against others, and why Amanda definitely is an artist to look out for in 2016! Already, a glance through the track list piques my interest, mainly due to the previously recorded and well-known “Shepherd”, first introduced on Bethel Music’s live project You Make Me Brave. The slow tempo piano led “Shepherd”, which later morphs into a majestic and grand epically sounding guitar led anthem, is lyrically sounds like something David would sing out of the Psalms. Bringing great joy and a sense of contentment, the song that at times sounds like a lullaby (that’s how transfixing and compelling Amanda’s vocals are!) highlights to us the fact that Jesus is our shepherd, He is our refuge, and the One who can and will help us in our times of need. As Amanda fervently cries out in the chorus that ‘…You will lift my head above the mighty waves, you are able to keep my from stumbling, in my weakness you are the strength that comes from within, the shepherd within my soul, take my hand and lead me on…’, I am once again struck with awe and wonder as I lift my hands and praise God’s name and splendor. Driven by ethereal keys and powerful drum beats, the epic worship anthem sets the tone for the rest of the album. Throughout the thirteen track album, Amanda’s heart for Jesus cannot be denied, as she worships wholeheartedly and delves into a wide array of issues. Album opener “Heroes” opens with a stirring electric guitar strum and a promise that we don’t have to act like heroes in our lives, instead we can ‘…trust, here in the mystery, I will, trust, in You completely…’. As Amanda ardently and eloquently sings out a worship song providing comfort and reassurance that God is in control, hope is offered to us, and the realisation that our strength comes from Jesus, and not from our own efforts. Musical and lyrical masterpiece “The Voyage”, which literally is a voyage in length (in the best possible way!) at just over 6 minutes, is also one of my favourite melodies on the album, led by reflective and calming keys, and containing quite a lot of boating and water imagery, as Amanda reiterates that God is working in us, and encouraging us to take a chance and step out of our comfort zone. Asking us to do something similar to Peter walking on the water, or Jonah forgiving his worst enemies in Nineveh, we are provided with all the reason we need to step out for an adventure with God, with Amanda reassuring us that ‘…I am the wind in your sails…’, sure to heighten our excitement, knowing that we are all in capable hands. “Never See The End”, describing the infinite qualities of God, introduces electronic effects, glockenspiel and a simple yet effective theme of God being perfect yet also loving each one of us infinitely and intimately, in a grand, epic slow-turned-to-epic worship anthem, with Amanda at her brilliant best vocally and lyrically; while the intricately layered and simply yet powerfully performed “Mercy” delves into the notion of mercy and that because of it, ‘…my past embraced, my sin forgiven, I’m blameless in Your sight, my history rewritten…’. With “Mercy” musically anchored by light acoustics, the song doesn’t really get off the ground in terms of instruments, yet really showcases Amanda’s vocals really well here, a highlight of the song for me. Piano prominent reflective and contemplative ballad “Kind” dispels the commonplace myth of God being a tyrant and a dictator, and instead reminding us all that Jesus is kind, that His love is unending, unparalleled, and ‘…is a fury all its own, sweeping the dust and turning feet towards home, carrying the orphans and resetting broken bones…’, and carries on from “Mercy” in using one specific quality of God’s and building an entire song from that theme, which works in this instance! Amanda also includes outright worship songs here, accessible for the church, not just singer/songwriter type songs. Case in point is “Closer”, the studio version of the popular live track made famous by Steffany Frrizzell-Gretzinger, sure to be sung in churches everywhere someday soon. Emphatically exclaiming that ‘…Your love has ravished my heart, and taken me over, taken me over, and all I want is to be with You forever, with You forever…’, Amanda ardently reminds us across moving and inspiring electronic keys, of the importance of being close to Jesus, that it is only through Him that we can fully understand and grasp His love for us, so therefore being close to Him is key in furthering our relationship with Him. Another thoroughly enjoyable worship melody that could also fit right at home on a Sunday morning set-list is “Highest Praises”, an earnest, honest and emotional piano led worship ballad, complete with an epic full band crescendo. As Amanda prayerfully declaring that the highest praises belong to God, singing out ‘…alleluia, we join with all of heaven…’ in the bridge; it’s a simple yet nonetheless impacting refrain sure to have all of us worshipping along with Amanda as well! Simple in it’s lyrics, yet somehow inhabited by the Holy Spirit and God breathed, the piano led “Bitter/Sweet” reiterates that God makes all things new, that ‘…You turn the bitter into sweet…You turn the winter into spring…’. Standing tall at almost six minutes, Amanda transforms a soft reflective piece into a grandiose, epic worship anthem, and the ease at which this is accomplished is nothing short of remarkable. While the theme of God making things new and restoring broken things is once again explored in the album’s penultimate track “City Of Hope”, another melody brimming with imagery and optimism. With Amanda reminding us in simple direct terms that ‘…You are mending the broken-hearted, You are making all things new, You’re rebuilding out of the ruins a city of hope with the ones You love…’- this phrase can mean two things- God is preparing a place for us in heaven, a city of hope, so that one day we will be with Him in paradise, however this could also mean providing us with the tools to make this world a better place. The fact that this song could mean a couple of different things is quite remarkable and deserves to be mentioned. Ending with the declaratory and emphatic worship anthem “Pieces”, led by electric guitar, strings, keys and every other instrument in between, and having Amanda fervently reminding us that we can worship God because of who He is, and all that He is, as we are reminded that ‘…You don’t give Your heart in pieces, You don’t hide Yourself to tease us…’; Amanda Cook’s Brave New World is an album to be listened to over and over again, as I am positive and certain that every time we listen to this multifaceted album, something different will be gained from the hour long plus experience. Particularly with God breathed piano led instrumental tracks “Brave New World” and “Flagship”, which are both cleverly placed in the album; Amanda has created something special here, and let’s hope and pray that album #2 lives up to the expectations placed because of the greatness of album #1. Well done Amanda, I hope and pray that Brave New World is recognised at the Dove Awards this coming year, or at least changes the lives of the many people who will listen to it! A brilliant album for a well-respected singer songwriter and worship leader! Amanda Cook should be proud of herself! A must buy on iTunes!